This website is built using the latest technology. This makes for a fast and easy user experince. Unfortunately, your browser doesn't support those technologies. Welcome to a new era of DJ’ing. From Serato and Roland, the DJ-808 integrates software, hardware and the TR-S drum sequencer into a single instrument for the very first time. 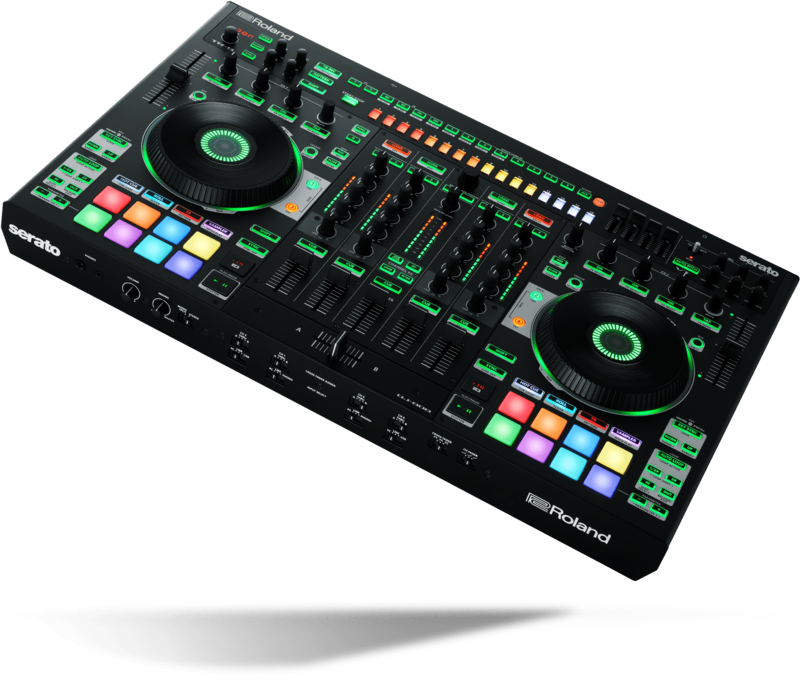 Melding the power of Serato DJ Pro with the genre-defining drum sounds and precision engineering of Roland, the DJ-808 will change the way you create music. The DJ-­808 is the first state-­of­-the-­art DJ controller to include built-­in drum sequencing with Roland’s iconic TR drum sound. 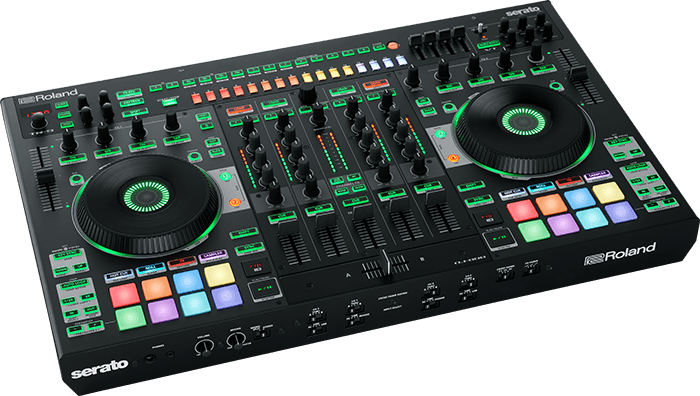 Also on board is a 4-channel mixer, vocal processing, ultra high-performance platters with dual-deck control, 2 AIRA link USB ports and the deepest Serato DJ Pro integration available, anywhere. Control over Dub Echo, Jet, Noise and Filter effects for each channel. Add effects and adjust the pitch of your voice to match the key of your Serato DJ Pro tracks. One of the lowest latency platters of any controller available. Comes with integrated displays with playback status. You can even control two decks simultaneously from a single platter with dual deck mode. Dedicated control over Serato Pitch 'n Time DJ with Key Sync and Key Shifting. 16 velocity sensitive RGB performance pads for control over Hot Cues, Loop Roll, Slicer, Cue Loop, Sampler and Pitch Play. Also a unique TR mode for control over the TR-S.
From the TR­-909's unmistakable hi­-hats to the wall­ shaking boom of the TR­-808, Roland drum machines have defined the sound of entire genres of music. 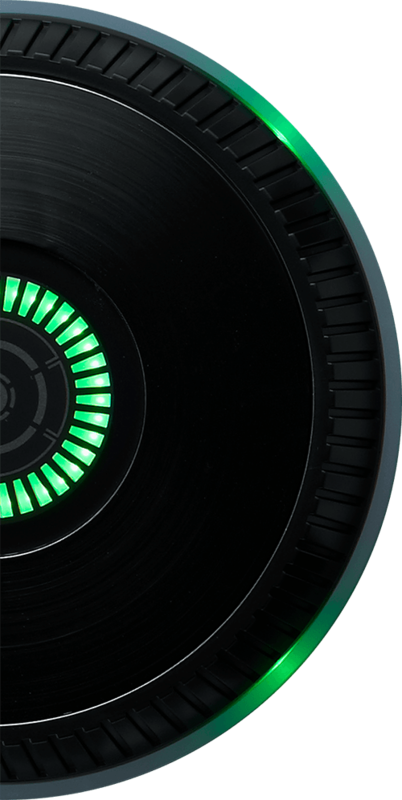 Only the DJ-808 integrates these iconic drum sounds into a state-of-the-art DJ controller. Customize your beats on the fly and in the moment with the DJ­-808’s built-­in TR-S drum machine and 16­-step sequencer. 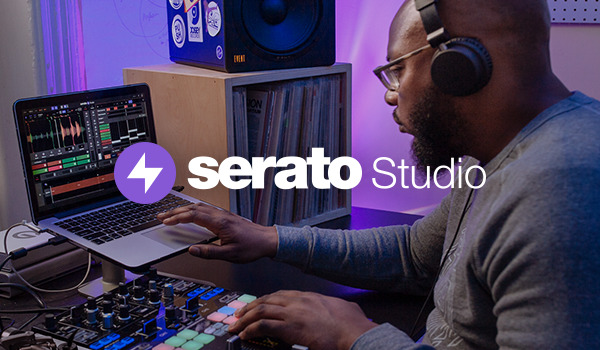 Lock your beats in perfect sync with Serato DJ Pro, or use the sequencer as a stand­alone instrument. Along with the iconic TR drum sound, the sequencer can also trigger the upgraded Serato Sampler, giving you freedom to mix individual drum sounds, layer kicks and snares, and build original beats with no limits. The DJ-808’s integrated TR-S drum machine includes the bass drum, snare drum, hi­-hats and clap from Roland TR-­808, TR­-909, TR­-707 and TR­-606 drum machines – the rhythmic foundation of house, hip­ hop and trap. Thanks to Roland’s acclaimed Analog Circuit Behavior, the DJ-808 faithfully replicates the peerless sound of the original electronic circuitry. Whether you’re a producer, a DJ, or both, you’ll take your craft to a new level with the DJ-808’s impressive built­-in connectivity for synths, turntables, microphones and more. Two AIRA link USB ports enable connection and sync of compatible Roland instruments and effects or use MIDI out for your anything with a MIDI input. Add synchronised keyboard arpeggios, live bass lines, leads and sound effects to your DJ sets or productions, and seamlessly sync your sound to Serato DJ Pro. Not only does the DJ-­808 have a high quality mic input with an XLR combo jack, it also has a dedicated vocal processor, the VT, that can dramatically transform your voice. Knobs for EQ, Pitch, Reverb and Formant make vocal effects easy, and the ducking capability will automatically adjust the volume when speaking or singing into the mic. The VT’s Auto Pitch function will use Pitch ‘n Time DJ on the incoming signal to match your vocal key to your Serato DJ Pro track. Cut, scratch and cue on state-of-the-art platters with one of the lowest latency of any DJ controller available, giving you incredible control over your music. The durable and responsive platters have integrated displays that clearly show playback status so you’re always in control. You can even control two decks simultaneously from a single platter with dual deck mode. Careful design considerations in the Roland DJ-808 take full advantage of everything Serato DJ Pro has to offer, including Key Sync and Loop functions which have dedicated sections so you can quickly adjust the key or shift the loop for a particular deck. You also get pressure sensitive performance pads for control over Cues, Loop Rolls, Sampler, the TR-S and PItch Play, plus dedicated control of Serato DJ Pro FX. 4 high quality integrated Channel effects including Dub Echo, Jet, Noise and Filter. Connect external instruments via MIDI or AIRA Link USB and jam along with Serato DJ Pro. Dedicated control of Serato DJ effects powered by iZotope for each channel, TR-S drum sequencer and external inputs. 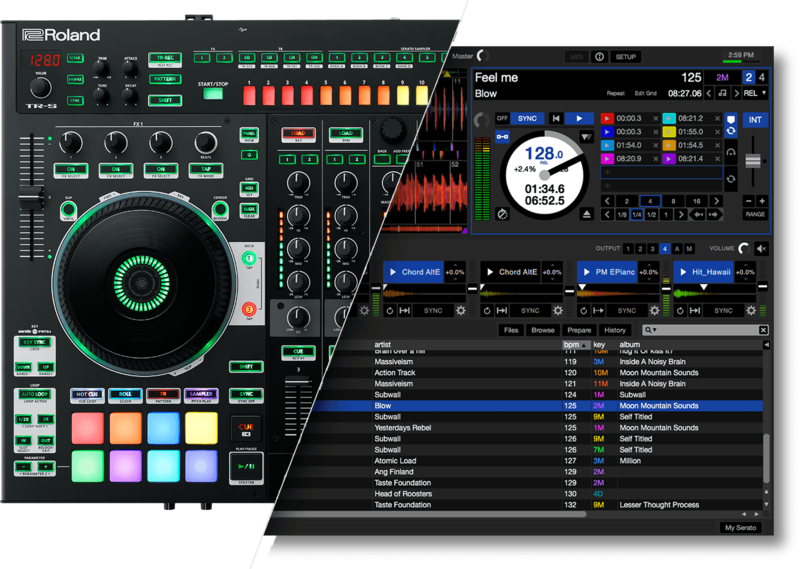 Serato Pitch ’n Time DJ included for Key Sync, Key Shift, Pitch Play mode and Auto Pitch on the VT.
Connect turntables or CDJs and control Serato DJ Pro with Serato Control Tone with the purchase of a Serato DVS license. We’ll be in touch as soon as the Roland DJ-808 is available in your location. Now available from the following retailers in the US. We recommend getting in quick, demand is high.